To understand why, you’ll need to know how an Australian metals trader—with help from the CIA—inadvertently triggered the invasion of Iraq. And how coalition troops were killed by bombs made with explosives that, according to the White House, never existed. You’ll need to understand how the United States air Force bombed a wedding in Afghanistan, and also learn why the U.S. gave material support to the president of Uzbekistan, who, as it happens, boils people alive. A above are not random disasters from an otherwise orderly war. 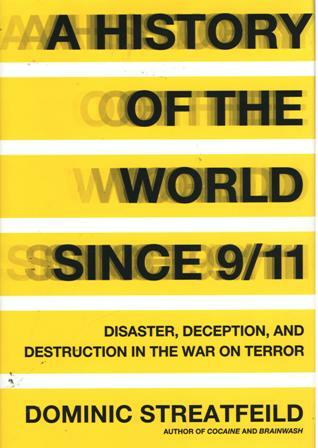 A History of the World Since 9/11 shows us we’re no closer to succeeding in the War on Terror than we were on September 12, 2001. We’ve failed to eradicate al-Qaeda or quell extremism. We’ve sparked civil wars in Afghanistan and Iraq. DOMINIC STREATFEILD is the author of Cocaine: An Unauthorized Biography and Brainwash: The Secret History of Mind Control, which was shortlisted for the Samuel Johnson Prize. He lives in the UK with his family.